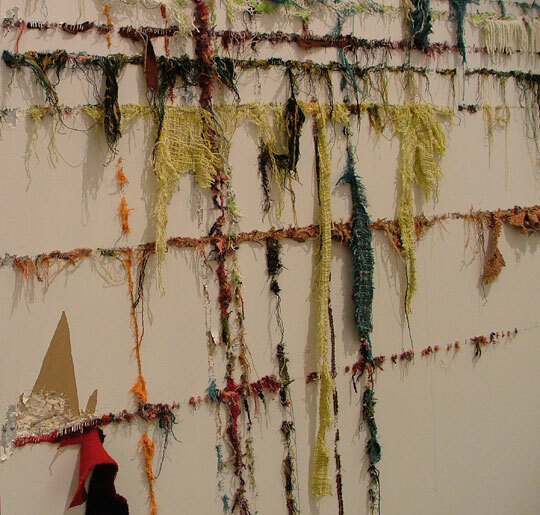 Mixed textiles collected in Noresund, Norway and New York City, embroidery floss, sewing needles. Elana Herzog. Detail - Untitled, 2017. 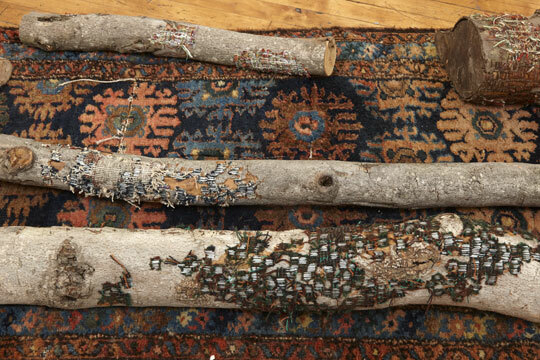 8" x 215" x 31"
Logs, metal staples, textiles, carpet. 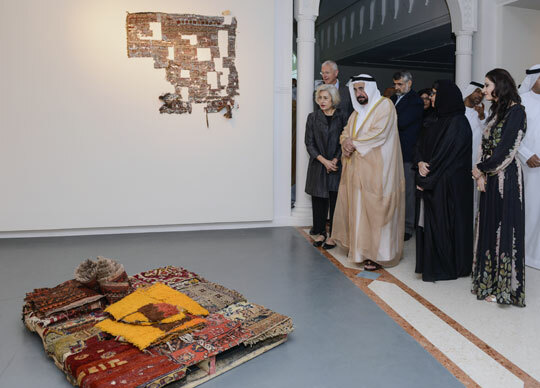 Installation views at Sharjah Museum of Art, Sharjah, United Arab Emirates, produced as part of the 18th Islamic Arts Festival, 2015/2016. Carpets, metal staples, laminated mdf flooring, wood pallet. 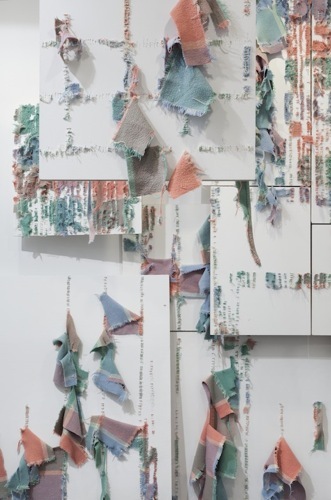 Elana Herzog, Scale Shifts; Vision Adjusts, 2015. Scale Shifts; Vision Adjusts - Installation views at Sharjah Museum of Art. 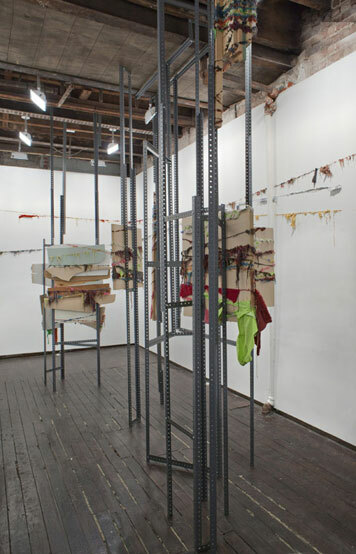 Scale Shifts; Vision Adjusts - Installation views. 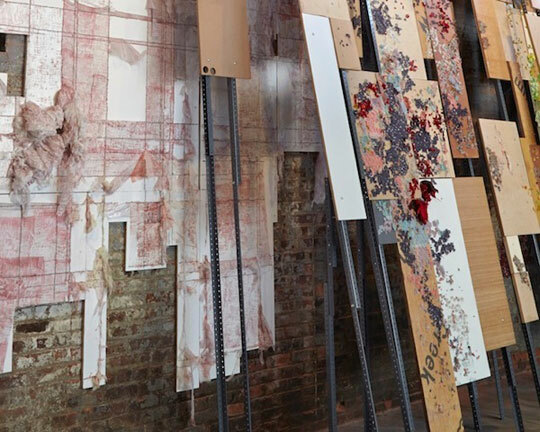 Fabric, wood, drywall, paint, steel. 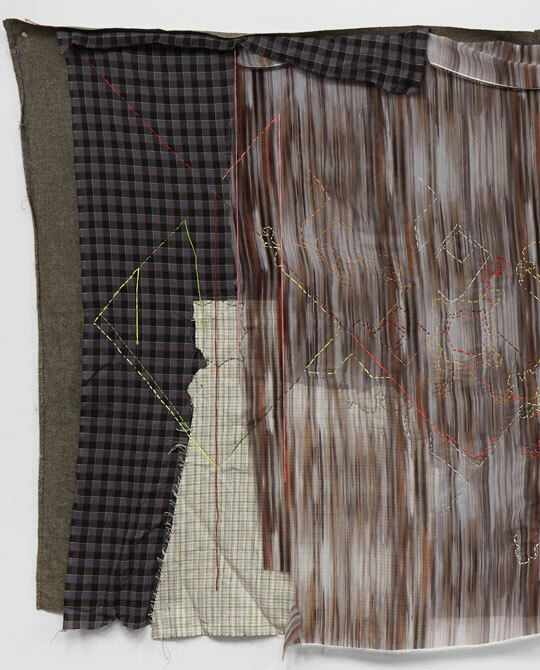 "I began using textile as a sculptural material in the mid 1980's when it was relatively absent from the mainstream of contemporary sculpture. It was part of a conversation that I was having with my own Modernist Heritage and the claims it was make about pure abstraction. The ubiquitousness of textile in every other aspect of life made it extremely suggestive of domestic drama, and slightly subversive. 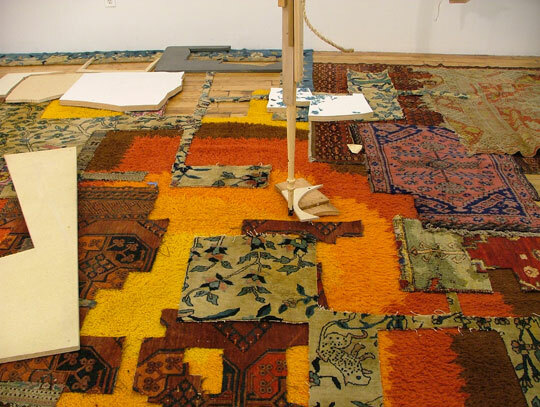 Well all of that has changed, and now we see textile in play in every art fair, and recently in the Whitney Biennial. Nothing subversive there!" 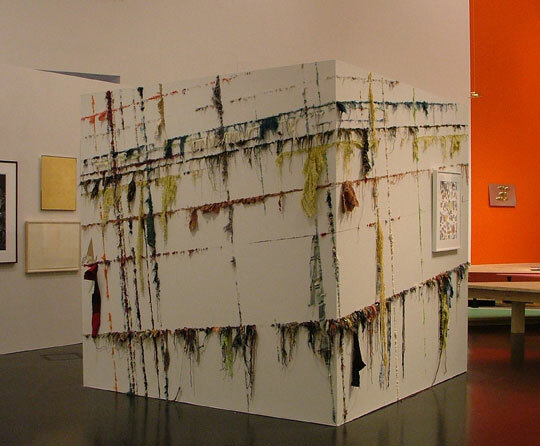 "One of the interesting consequences of receiving the Lillian Elliot award in 2003, is that I became very aware of the self described field of "Textile Art," which I had been largely oblivious to until that time. Given that so much of my work is focused upon taking apart existing things - be they used, or new, it amazed me that a community of "makers" would find what I did interesting. I appreciated the recognition that I was granted, and began to learn of some of the fascinating thinking that was going on in this world. It certainly has continued to grow for me as a field of interest and enriched my work tremendously." 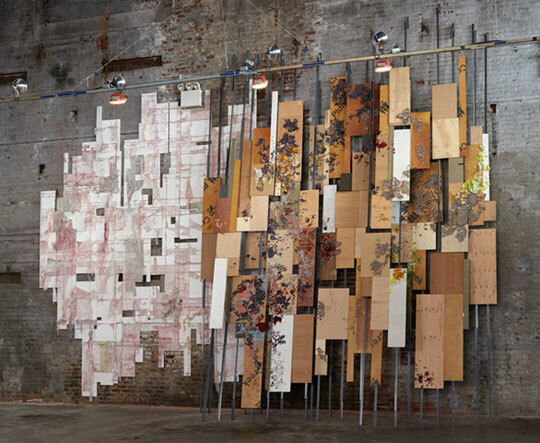 128" x 103" x 49"
Plywood, paint, metal staples, wool blankets. Elana Herzog, Southern Lights, 2014. Installation view in my studio; dimensions variable. 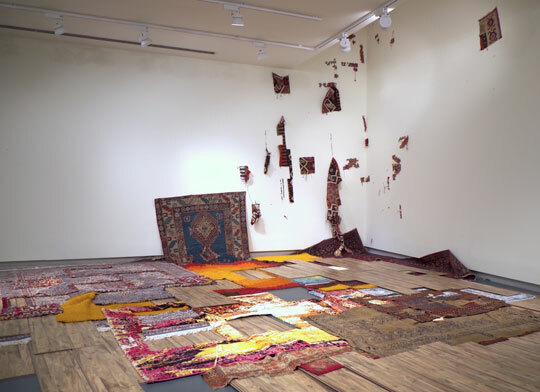 Fragments of area rugs of mixed origin, wood and fiberboard, laminates, paint, fabric, metal staples, found painting. The Return of the Repressed was initially conceived for a group show called "[B19]", which was inspired by the contents of Sigmund Freud's Vienna office. 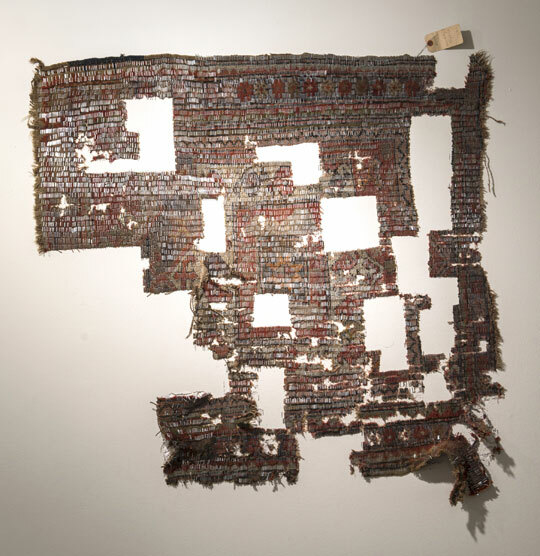 His office was notoriously draped in Persian Carpets and filled with other artifacts. 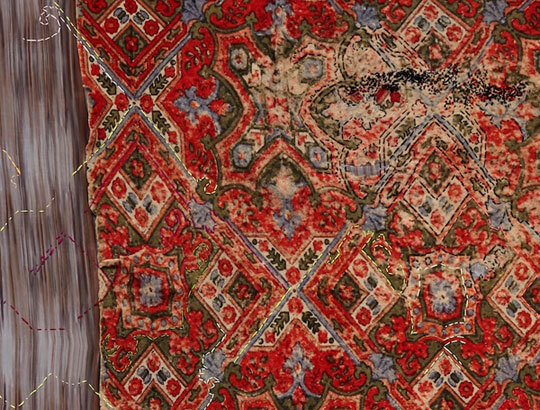 I was asked to contribute a work that made use of carpet. 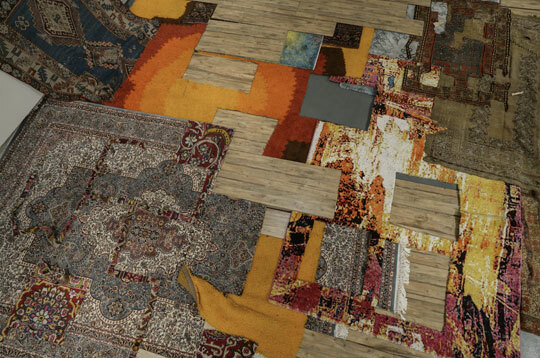 Here I've combined a large mid twentieth century shag carpet with a large assortment of Persian carpet fragments into a fluid collage of overlapping richly colored, perforated surfaces. Above this I have arranged and suspended other mixed media sculptural components. Elana Herzog, The Return of the Repressed, 2012. Detail - The Return of the Repressed. 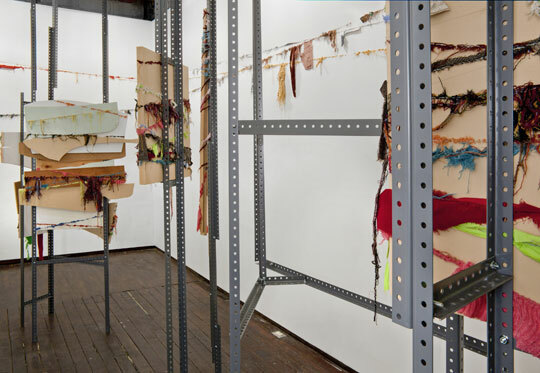 Installation view at Lmak Projects, New York City; dimensions variable. 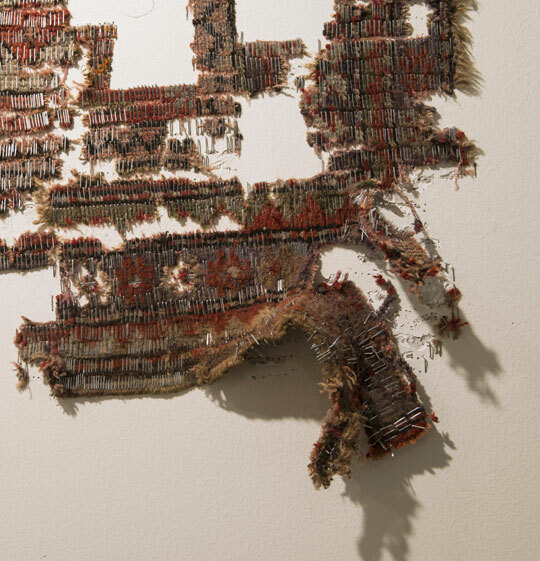 Metal staples, textile, wood, steel and mixed media, gallery walls. 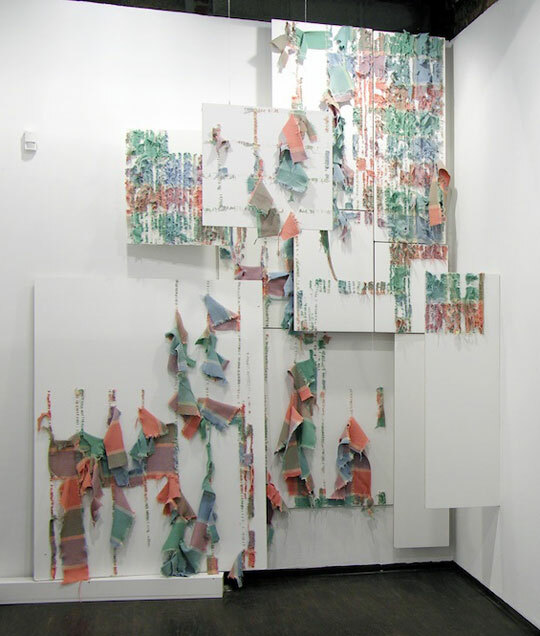 The dynamic configuration of overlapping diagonal lines activates both the gallery walls and the surfaces of mixed media freestanding constructions. Steel shelving posts are used to create open forms which reference the billboards, easels, the modernist grid, industrial and domestic landscapes. Elana Herzog, Into the Fray, 2011. Detail - Into the Fray. 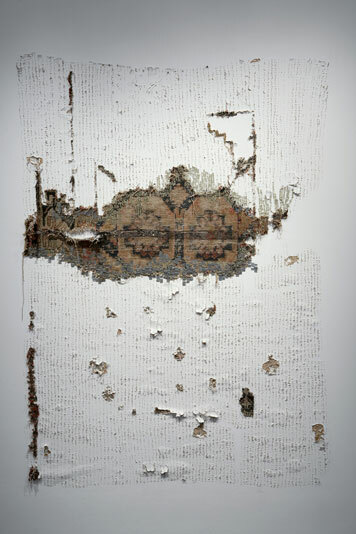 Textiles, metal staples in drywall construction. 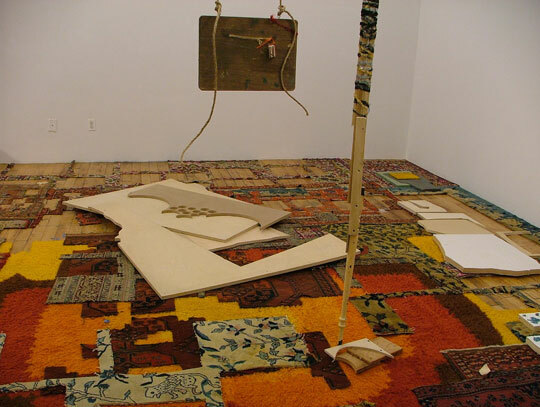 Romancing the Rock was a temporary installation made for "The Jewel Thief", a group show curated by artist Jessica Stockholder and curator Ian Berry at the Frances Young Tang Museum at Skidmore College, Saratoga Springs, New York. I worked on two faces of an 8ft x 8ft x 8ft cube that was built as part of Stockholder’s exhibition design. A framed work by Polly Apfelbaum hung on one side of my piece. 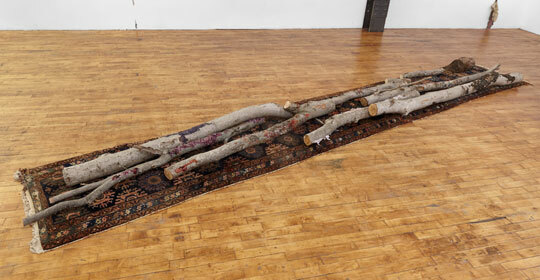 Elana Herzog, Romancing the Rock, 2010. Detail - Romancing the Rock. Sheetrock, plywood, metal staples, wool carpet. 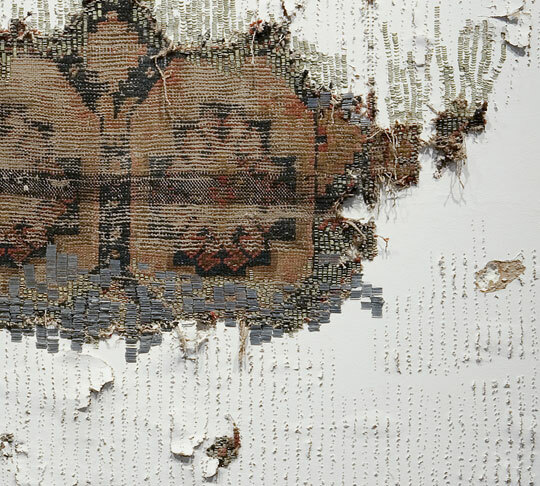 Elana Herzog, Detail - Untitled, 2004.